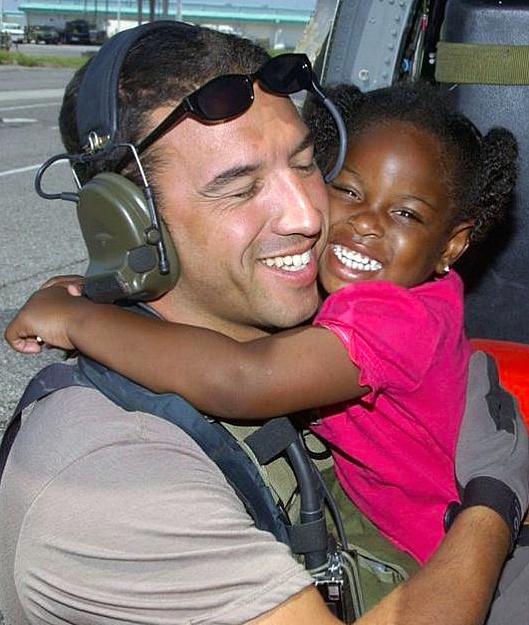 In the wake of Hurricane Katrina's calamitous effects, an image of U.S. Air Force Staff Sgt. Mike Maroney locked in a heartwarming embrace with a young girl he encountered during rescue operations became a symbol of hope and optimism. For the last decade, Maroney has been determined to meet the child he hugged in the iconic photo. In March, the Air Force Times launched the "Find Katrina Kid" campaign to help Maroney reconnect with the little girl. Just last month, leading up to the 10th anniversary of Katrina, Maroney remained hopeful in his quest and told AccuWeather it was "only a matter of time," before they came in contact. Now, his persistent efforts have come to fruition. In a story released Wednesday by People Magazine, Maroney, who is now an Air Force Reservist, said he has found the girl, identified as LeShay Brown, 13, of Waveland, Mississippi. The two are expected to reunite later this month in New Orleans. "I can't wait to meet her to tell her how important she is," he said in an interview with People. As it turned out, word of the campaign, which had circulated through news outlets and social media with the #FindKatrinaGirl hashtag, made its way to the community where Brown lived, the magazine reports. "The whole neighborhood told us they saw LeShay on the news and everybody told us someone was looking for her," LeShay's mother, Shawntrell, told People. Soon thereafter, LeShay contacted Maroney. LeShay told People: "I was excited that he was looking for me for such a long time." Despite being in the middle of a catastrophe, LeShay's resilience and bright smile has always stuck with Maroney. After LeShay and her mother had been rescued and were being transported by helicopter to Louis Armstrong International Airport, Maroney said the girl was comforting her mother, who was visibly shaken, and remembered her saying, "It's okay, Mom, it's okay. We're safe now." Maroney never got the chance to say goodbye after they parted ways at the airport, but now he can finally tell her how much she meant to him. "I want to let her know what she's done for me, and that hug was very important, and that I think about her and her family," Maroney told AccuWeather. "That hug could've been 10 seconds or 10 hours, I don't know, but everything was good at that moment and they just happened to get a picture of it. I got pretty lucky."